After a very impressive 40th birthday meal at Restaurant Sat Bains in April 2010, I decided that on the gourmet trip up north with Darcy and Bob, Nottingham would be a mandatory stop so that they could experience this restaurant (as well as see a bit of Nottingham where I spent 3 years of my life). I reserved the chef’s table so that we could have a room to ourselves to chat, and also see a bit of action in the kitchen. 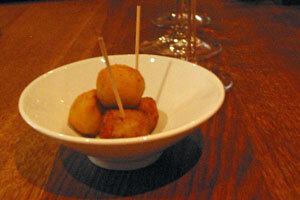 Our first course was mushroom soup with mushroom ketchup and powder, served with pigs head croquette cubes and the round smoked haddock fritters. 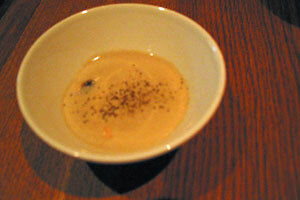 The soup had a very intense pleasant mushroom flavour – it was a promising start to the meal. The next course was the additional optional course Ham, Pea and Egg, in which the duck egg was cooked at 62 degree Celsius to give the yolk a nice gooey texture – As Darcy and Bob were from the USA, I had to explain a bit about the BBC television show Great British Menu and why they had to try this course (even though I didn’t really need to spend too much effort to persuade them – they just decided to go for it!). Darcy only needed to mutter one word to show her approval of the dish: “Gosh!”. 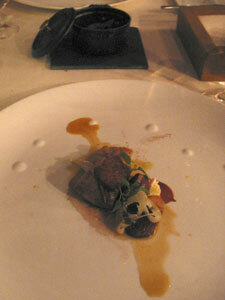 The scallops that followed was cooked with curry powder, chorizo, squash and muscovado. 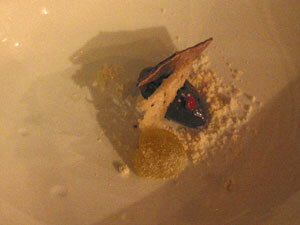 The aroma of the curry powder provided a nice accent to a dish which had a good combination of texture and flavour. The organic salmon with pickled vegetables had a beautiful texture of the fish, and it was accompanied by a gorgeous oyster emulsion which was made up of shallots, dashi, oyster and parsley. 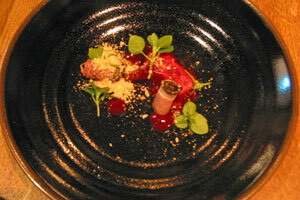 The Goosenargh duck liver parfait with beetroot jelly, beetroot puree, hazelnut and duck powder (made from blackened Lancashire duck skin) was beautifully presented. However, while the taste was good, it did not elevate to the same level as the presentation, and the reaction around the table was more lukewarm. The roast chicken wing with salt-baked celeriac remoulade was accompanied by a very rich flavoursome gravy – it was as close as you could get to comfort food really. The final course before the cheese and desserts was shoulder and loin of mutton braised with caramelised onions/shallots and onion powder with caper and elderberries. The aroma of this dish was stunning, and the meat was so tender that it literally came off as soon as the knife touched it. 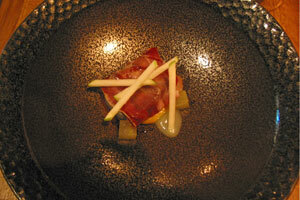 According to Russell, the only problem with this dish was that there was not enough of it! 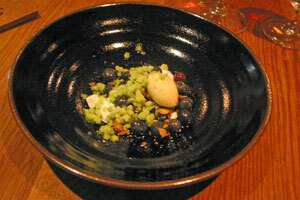 There were three dessert courses: the first one was blueberries with vanilla ice-cream, meringue and tarragon granita. 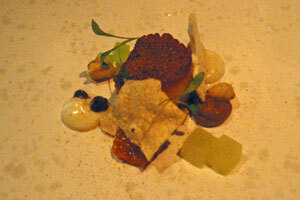 It was refreshing, light and airy – an excellent start to the dessert course. 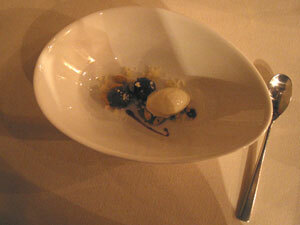 In fact, Darcy who’s not a big fan of desserts commented that she could have had another plate of this quite happily. 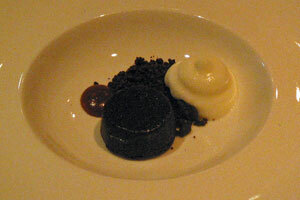 The second dessert was chocolate with yoghurt and spiced caramel. Unforunately I found the chocolate too bitter and did not really go well with the rest of the dish. 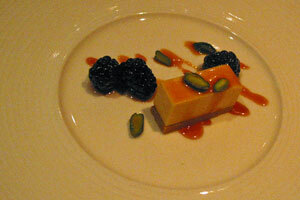 The final course was sea buckthorn mousse with blackberries, pistachio and sea buckthorn caramel. The base was good, and the various ingredients worked well together in the dish – an absolutely lovely way to finish this rather memorable dinner. Once again Sat Bains has managed to impress us with dishes that had beautiful aroma, looked like pieces of artwork and tasted wonderful. A restaurant that we would return again (and again)…. Sometimes you make plans well in advance, but they just don’t work out. 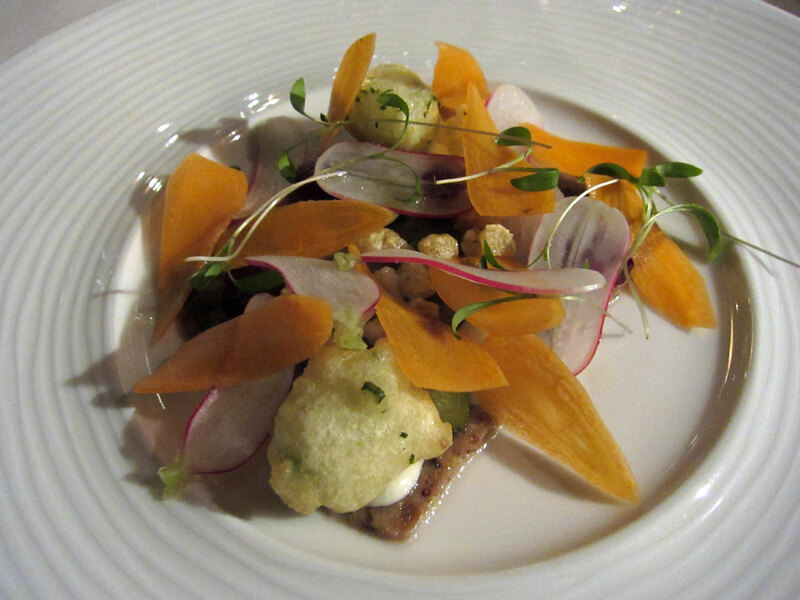 It didn’t even cross my mind to go to Restaurant Sat Bains for dinner on my 40th birthday. 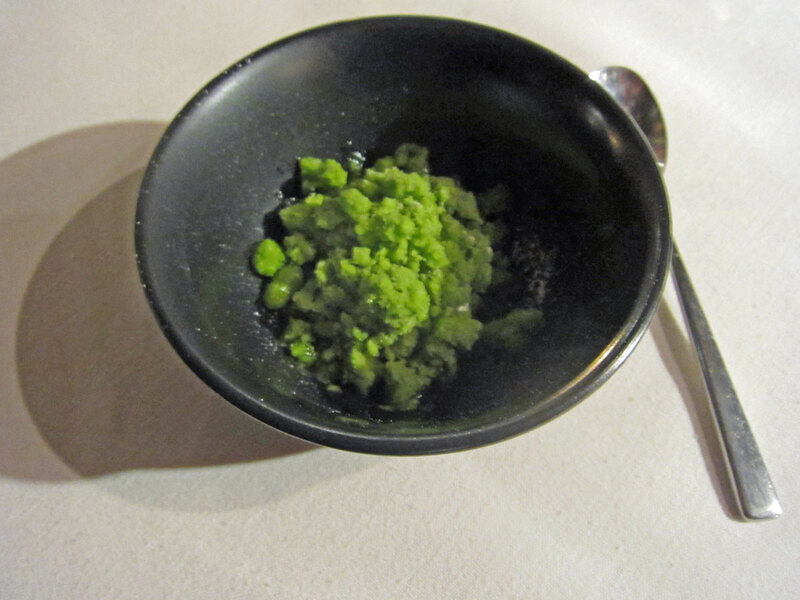 I have talked for years to go to El Bulli but I missed the window of opportunity of booking the table last year when I was on holiday; and then with the weak pound, I refused to go anywhere in the Euro-zone (so Noma and a few others on the continent are out of the question). 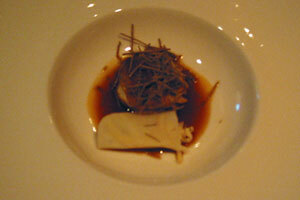 Then looking within the UK, I was scouring for a restaurant that I have never been or not been for many years. The first choice was Marcus Wareing, which didn’t have the table on the day but in the end I visited the evening before my birthday. Then it suddenly dawned on me that Sat Bains has been on my list for a few years and I never made it there, despite driving past Nottingham a couple of times in the past 2-3 years; and one day things were going so wrong at work that I just thought “Forget it, I am going to book a table at Sat Bains for my birthday!”, and everything worked in my favour – so I secured the table. 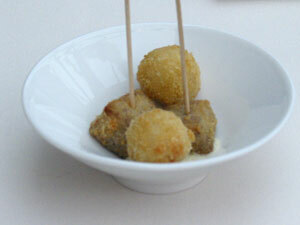 The hopes were high, having read many positive reviews about the restaurants. However, I was well aware that my birthday dinners didn’t always turn out well – last year I had high hopes on Umu, but it turned out to be one of the most disappointed and expensive meals I had! Luckily the curse of the “bad birthday dinner” failed to materialise on my big birthday. I knew Nottingham pretty well, and was surprised when I saw on the map the location of the restaurant. I thought to myself: “Surely not, that’s not a nice part of Nottingham!”. It’s not far from Lenton Industrial Estate though it’s not visible from the restaurant. It’s also unfortunate that there were 2 giant sets of electric pylons directly above the venue – but if you ignore these aesthetic shortfalls, you would be rewarded with an outstanding meal. 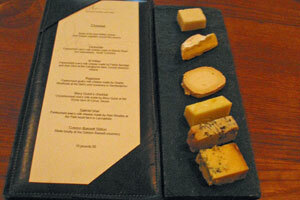 The tasting menu that was included in the package was the 10-course menu. 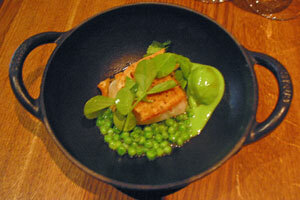 In addition, we have also ordered the Ham, Egg and Peas as an additional course. 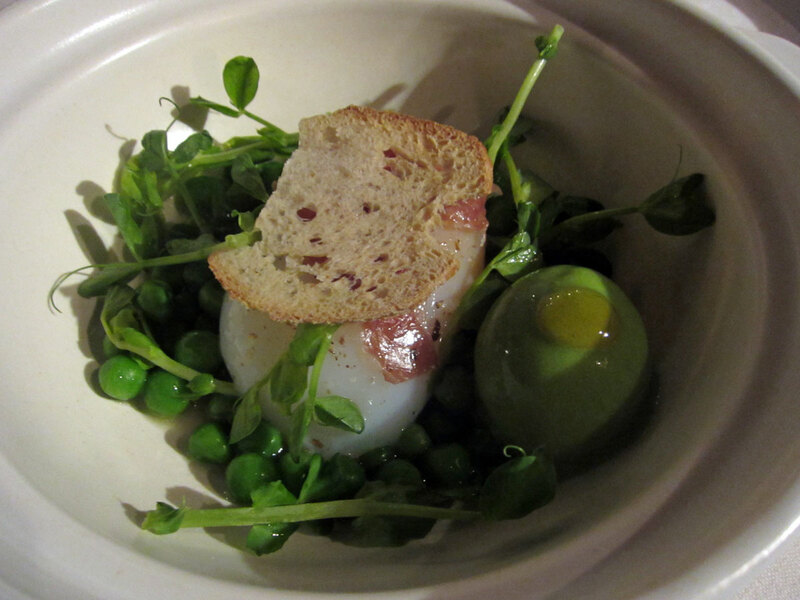 The first starter was the Ham, Egg and Peas – This dish was the winning starter at the BBC Great British Menu, and was served at the British ambassador’s banquet in Paris in 2007. 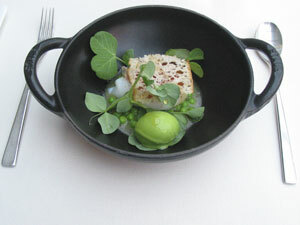 The duck egg was cooked nicely and was served with peas, pea sorbet and Bellota ham. It’s more a summer dish but it worked well even in a cool April evening. (1) Scallops, with smoked roe, alexander and lovage – Comparing to the scallops I had the night before at Marcus Wareing, this dish won hands down. OK, the scallops might not be as fresh and full of flavour as Nathan Outlaw’s down in Cornwall, but Nottingham being quite some distance away from this sea, this could be forgiven. (2) Organic Salmon, served with parsley, radish and passionfruit. 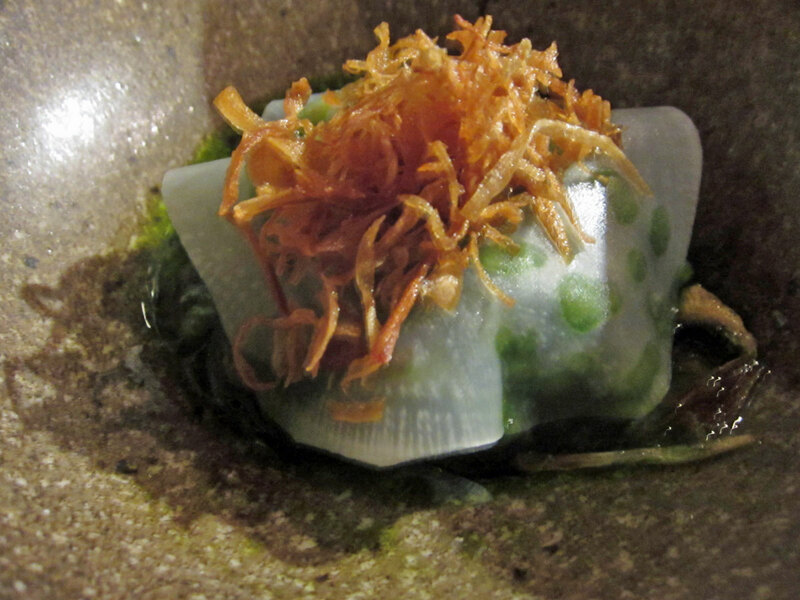 This fusion dish demonstrated how to make a dish that combined the East and West without going overboard – instead of using soy sauce for that Asian twist and at the same time overpowering the fish, the flavours and textures of the other ingredients just re-created the delicate style of Japanese cuisine . There were ample pieces of salmon to make this a worthwhile dish – often in some restaurants they would serve such small amount of salmon that it barely filled the gaps between the teeth. 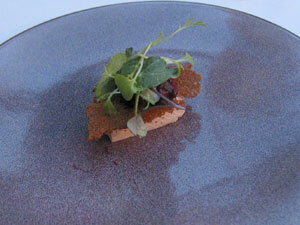 (3) Duck Liver, beetroot ketchup and gingerbread. 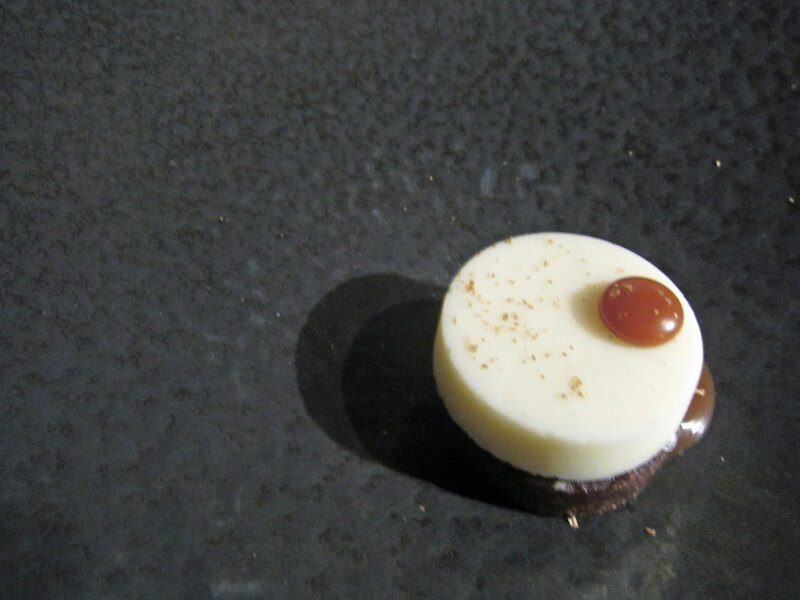 I was not a fan of gingerbread at the slightest usually, but I was more than happy to finish this dish. 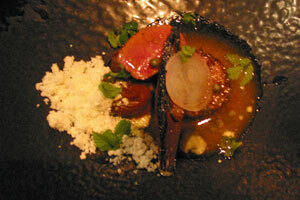 The duck liver was smooth and very rich in flavour and worked well with the other ingredients. 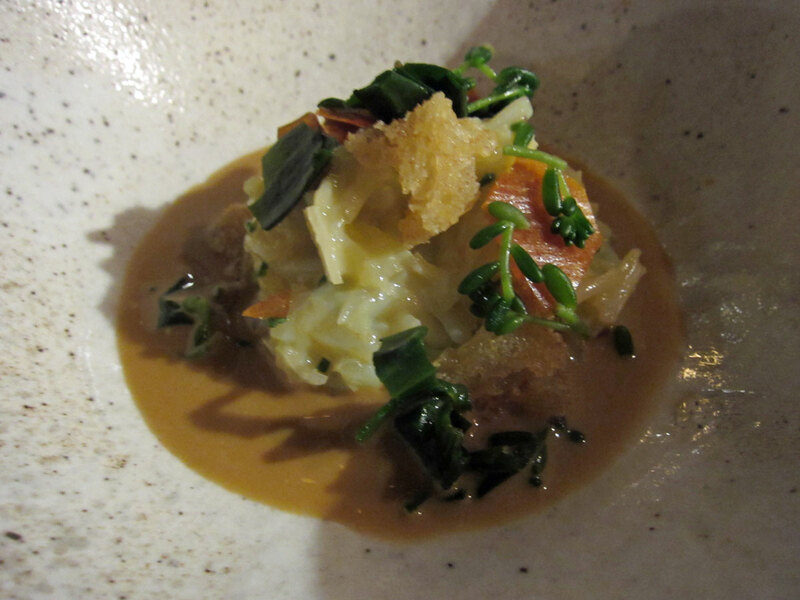 (4) Leek, brown butter, hazelnut and shallot – Simple ingredients in this dish, but I said “wow” when the dish was placed in front of me and the fragance hit my nose; then I said a second “wow” when I had my first taste of this dish. 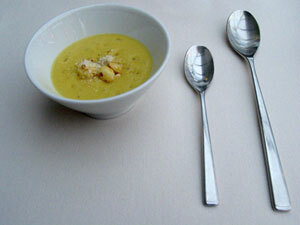 It was truly amazing what could be achieved in terms of smell and taste, without resorting to any expensive ingredients. 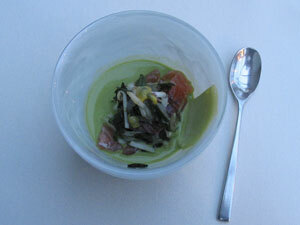 (5) Waldorf Salad (1893-2010). 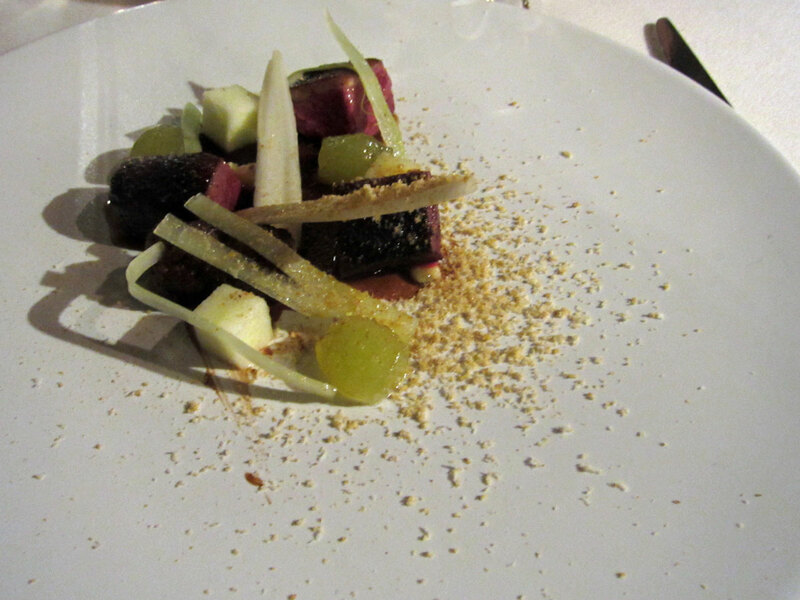 Not being a fan of the Waldorf salad (esp after the below-average one from the actual Waldorf hotel in New York a few years ago), I was not looking forward to a plate of leaves with apples and grapes. 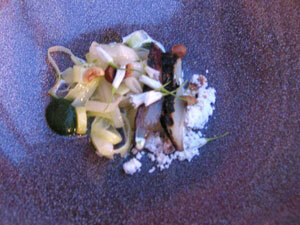 However, this dish was a deconstruction of the Waldorf salad. After the full-on flavour from the last two dishes, this “salad” was refreshing and cleansed the palate, paving the way for the next course. (6) Cumbrian Lamb, lemon confit, goats cheese, black olive – the lamb was cooked to perfection: it was moist and easy to cut without a proper meat knife. 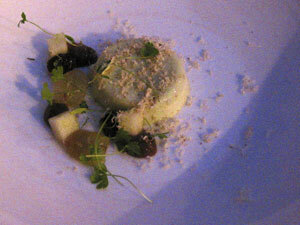 The goats cheese was strong and it brought out the flavours in the rest of the dish rather than overpowered them. 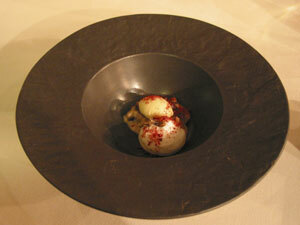 (7) “The Crossover” – As the name suggested, this dish marked the point of crossing over from savoury dishes to desserts. 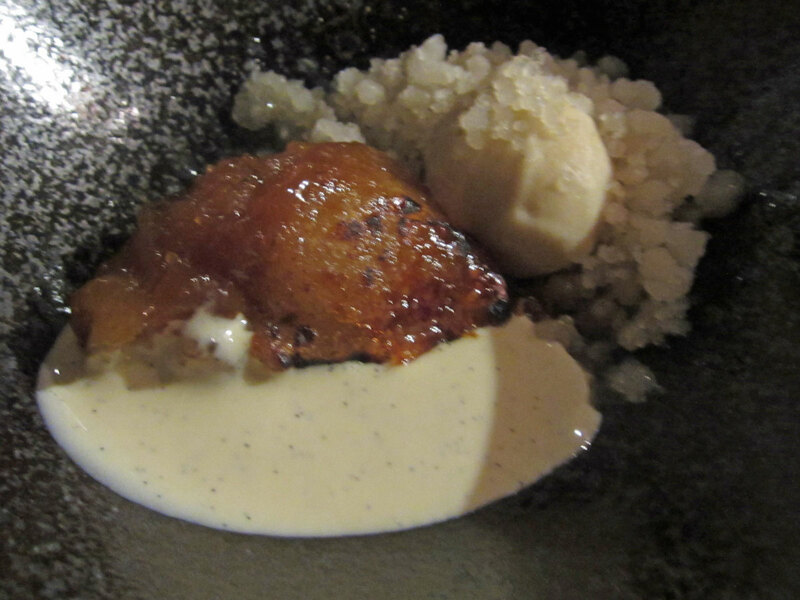 The sweetness of dried fig and ice-cream worked well with the saltiness of parmesan cheese with a splash of port syrup, and a welcoming change from the usual “salted caramel” found everywhere else these days. 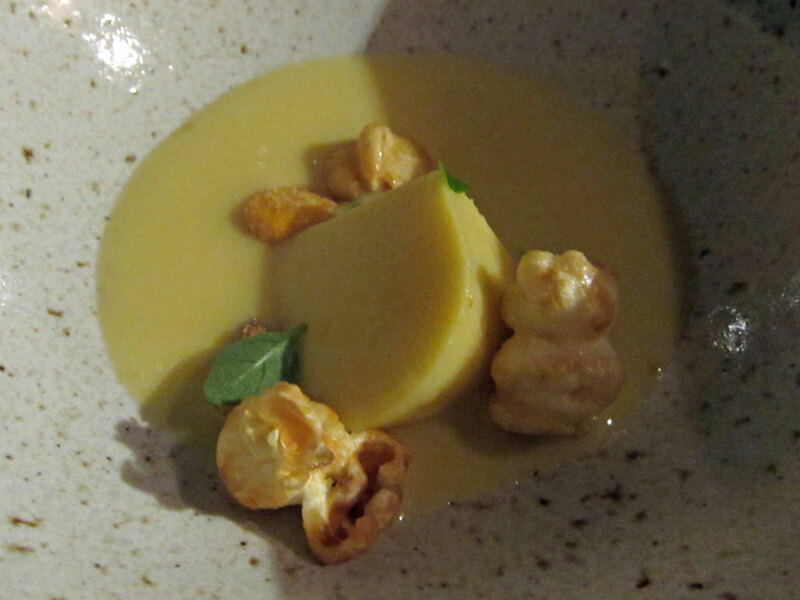 (8) Apple Porridge, yoghurt, honey and puffed rice – this reminded me of the “breakfast” prelude (ie parsnip flakes and parsnip milk) at Fat Duck, but better! I would very happily eat this first thing in the morning as well as towards the end of dinner. This was a truly “all-day breakfast” kind of food. (9) Olive Oil, chocolate, flowers – the delicate olive oil jelly went surprisingly well with the strong flavour of the dollop of chocolate. 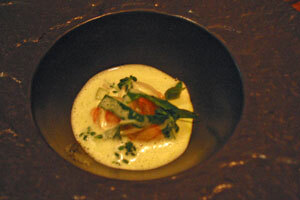 The flower petal added an elegant touch to the dish. 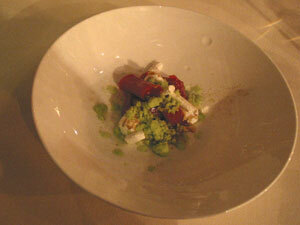 (10) Yorkshire Rhubarb, with tarragon, anise and marshmallow – personally I found the rhubarb a bit too sharp for my liking and would have preferred a bit more marshmallow to even that out; but for rhubarb lovers this would be a dish to die for. This is a truly outstanding restaurant. 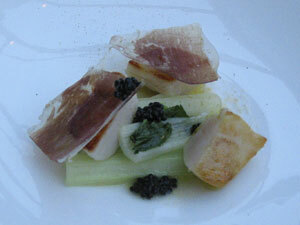 If you are looking for foie gras and caviars, you might be disappointed to find none here. However, for a true taste experience without the over-dramatic fuss at Fat Duck, it’s worth a trip to Restaurant Sat Bains. The menu had a diverse set of ingredients and flavours, and the order of the courses was well thought out – strong flavour dishes were separated by milder flavours to cleanse the palate. For me personally, now I have another good excuse to go back to Nottingham, and it’s not even to visit my university.